Seniors in the Frenship High School Class of 2019 are welcome to apply for the Frenship Foundation for Leadership’s Character Scholarship. Seniors in the Frenship High School Class of 2019 are welcome to apply for the Frenship Foundation for Leadership’s Character Scholarship. The 2019 application is available and can be found here. The deadline for students to submit the application is Tuesday, March 5. 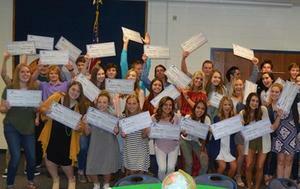 Since 2003, the Foundation has granted more than $700,000 to 276 FHS scholarship recipients. The purpose of the Foundation’s scholarship is to recognize consistent effort, to promote leadership and to develop character in students of Frenship schools while stimulating a desire to serve others and further their education. The Foundation will also host its annual “Drive for Leaders Golf Tournament” on Friday, May 3. The tournament was created to financially support the student scholarship program. Any parties interested in participating in the tournament and supporting Frenship students may contact Cindy Stephens, Director of the Frenship Foundation for Leadership at (806) 866-9541 ext 225 or cstephens@frenship.us. To learn more about the Foundation, visit their website at https://frenshipfoundation.org.